For International Day of Yoga, IB staff member and yoga teacher Kate Kuhn offers tips on how to make mindfulness an integral part of school life. If you’re an educator or a student in a busy school setting, finding a large chunk of time to practice yoga or to meditate can seem impossible. It probably is. Much easier, though, is to build in a few purposeful pauses throughout the day. 1. Stop what you’re doing and bring complete awareness to what is happening in the moment. Say to yourself: “My feet are on the floor. I am sitting in my chair. I am standing in this room. I hear noise in the hallway”. 2. Inhale for the count of four. Pause your breath briefly at the top of the inhalation. Then exhale for the count of eight. Pause at the bottom of the exhalation. Repeat this breathing pattern for one to two minutes. Stay focused on your breathing to slow down your nervous system and help you regain balance and calm. 3. Resume your natural breathing pattern. 4. Notice without judgment what is happening in this moment. 5. Move with intention to the next task at hand. For more tips, here are some ways that IB World Schools are promoting wellbeing and mindfulness across the globe. At Halcyon London International School, London, UK, teachers have been trained in cognitive coaching. Students meet with their coach every two weeks for a one-on-one, 15-minute session to discuss academic worries, stress, mental health and wellbeing. Relationships have improved and students are sharing information that “uncovers a huge range of student experiences that we just would never have seen otherwise”, says school director Barry Mansfield. “From cyberbullying and the impacts of social media on relationships to being able to offer them the meditative skills they need to resolve problems, the results have been great”. Read their post in full What value do you place on your students’ mental wellbeing?. At Queensbury High School, New York, USA, students staged what they called “a stress fair”, engaging the help of a local dog therapy organization. Therapy dogs (animals specially trained to provide affection, comfort and love for people in need) were brought into the school to interact with the students at exam time. It’s a process which has been proven to lower blood pressure, lessen depression, decrease feelings of isolation and anxiety, and increase focus and literacy skills. Read their post in full Students take time out to focus on wellbeing. Teachers of the Primary Years Programme (PYP) at Pathways School Noida, in India, have encouraged empathy and tolerance among their students. Group sessions in the classroom now include the discussion of self-image and emotions, visualization, breathing, pebble meditation, and maintaining silence during the ringing of a bell. “Within the span of a month, a visible calmness descended over the students”, PYP teachers Kriti Nigam and Aarti Bakshi explain. “They started displaying mindfulness during bus dispersal and lunch hour. Even arguments with each other were replaced by discussions and quiet thinking. These students were happier, more focused and were showing signs of developing strategies to deal with the anger and frustration”. Read their post in full How teacher and counselor join forces (available in English only). Rivercrest Christian College in, Clyde North, Australia always finds the end of term busy and frantic. Last year, in order to calm things down, they staged a wellbeing week, offering students and staff the chance to slow down and participate in community activities such as chess, board games, gardening, soccer and country walks. “Students learned how to balance their lives and make time for the small things like morning walks, playing games with families and spending time outdoors in nature,” said Matthew Scott, deputy head of primary. Read their post in full Stop. Take a break. Marie Curtis, a librarian at Colegio Internacional de Sevilla San Francisco de Paula, in Seville, Spain, is offering parents and students classes in mindfulness and a healing technique called bibliotherapy. She uses books and storytelling to encourage parents and carers to explore their feelings and anxieties with their children, and to discuss difficult behavioural situations. “Mindfulness improves attention and focus, emotional regulation, behaviour in school, social skills, empathy and perspective taking”, she says. “There is also good evidence that reading fiction helps develop social skills by exercising and developing the part of the brain involved with feelings of empathy”. Read their post in full A good book at the right time can be life changing. At The American School of the Hague, Netherlands, students learned a very effective method for reducing stress in exam situations. It’s called 7/11 breathing and is similar to the method suggested by Kate Kuhn (above). Students are taught to breathe deeply, counting to seven on the inhalation, and to 11 on the exhalation. 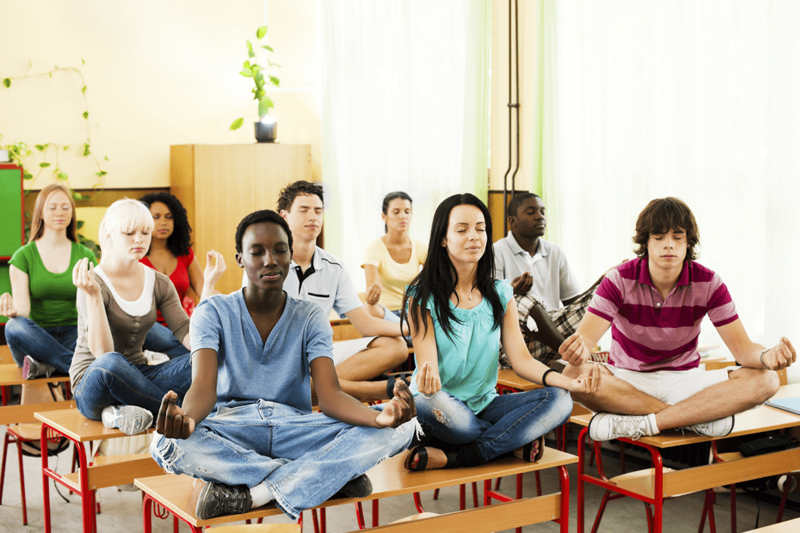 “Students used it first in the mock exams so that they knew it was coming and didn’t suffer increased anxiety over fear of losing exam time”, explains mindfulness educator and IB parent (at the time of writing his post) Kevin Hawkins. “Student feedback has been very positive and it would be wonderful if more schools tried it out”. Read their post in full Exam time … take a breath! Effective affective skills in action. Cobourg Collegiate Institute, in Cobourg, Ontario, Canada, operates a student wellness programme where experts from the community talk to students about maintaining a healthy school-life balance. “We cover topics such as time management, diet, sleep, study skills and also offer yoga and meditation workshops”, explains lead teacher Erin MacKenzie. “The hope is that students will incorporate these strategies into their everyday lives so that when we get into the exam weeks, they are second nature”. Read their post in full Keep calm and carry on. Do you have suggestions to promote wellbeing for teachers and students? Feel free to post them in the comments section below to share your tips with others.